At the upcoming ISE 2017 in Amsterdam, Audio over IP company Barix will update its Audio Signage platform with free firmware to deliver multiple audio tracks to single- or multi-screen digital signage installations. Barix will exhibit at Stand 8-N270 in the RAI Exhibition and Conference Center from February 7-10. The updated Barix Audio Signage solution works in situations where digital signage needs the additional boost of streamed audio to effectively deliver its message. 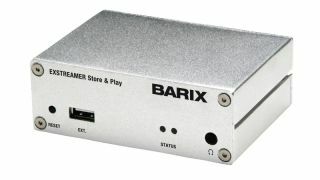 Though previously simple and low-cost to support single-channel streams using the Barix Instreamer and a free Audio Signage mobile app, the second-generation Barix approach now solves the challenge of delivering multichannel streams as simply, quickly, and inexpensively as possible. Barix Audio Signage is purpose-built to deliver audio streaming to mobile phones with very low latency, enabling audio tracks to synchronize with digital signage content, and is well suited for use in hotels and museums that using digital signage. Brader noted that the key challenge in deploying audio signage lies in the network configuration and Wi-Fi environment on location. He adds that given the straightforward nature of the Audio Signage platform, systems integrators can easily test and evaluate a facility’s network to ensure that Audio Signage works on the network’s current configuration, or whether its Wi-Fi capability requires strengthening.